Workplace collaboration tool Convo is today rolling out a much-requested feature – cross-platform chat. We rely on Convo within the TNW editorial team and as an editor, being unable to chat to team members privately on the go within the same app that we discuss the stories that we cover has been a real pain. Apparently, we weren’t alone; Convo CEO Faizan Buzdar tells use that it was the most-requested feature from his customer base. The new chat function works as you’d expect – you can select someone to talk to from a ‘Teammates’ tab and then talk to them in a ‘Chats’ tab. 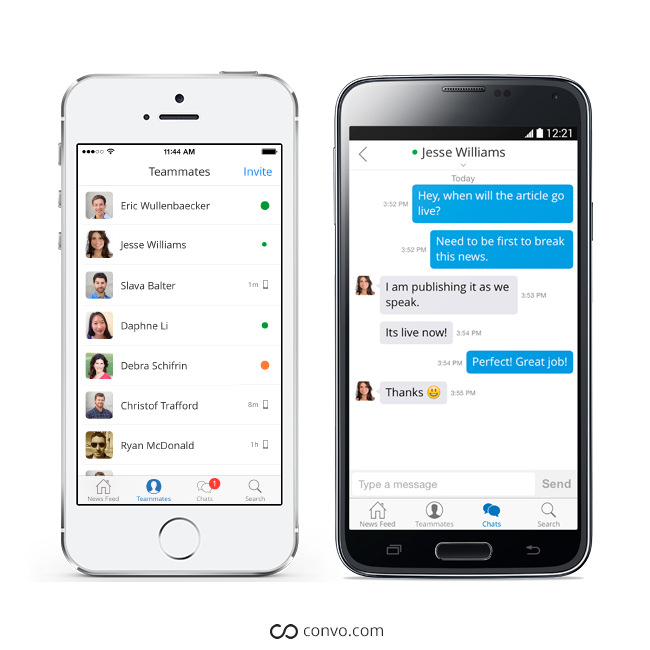 Conversations are synced across desktop, iOS and Android, all of which are receiving an upgrade. Until now, chat was only a desktop feature, and conversation histories weren’t always kept, making the feature unreliable for discussions you may want to refer back to later. Buzdar says that today’s update reflects the increase in mobile usage by Convo users. Indeed, he tells us that use of chat increased 205 percent after Convo’s staff started using the new implementation internally. Slack is the current hot property in the work team communications field, but Buzdar isn’t too concerned about it, emphasizing that Convo is ‘feed first’ versus Slack’s ‘chat first’ approach. Yes, cross-platform chat in Convo is very much a value-add rather than a key proposition, but it’s one that its users will very much welcome.